Map of California as an island. Ink and watercolor with pictorial relief. 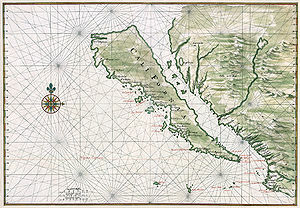 English : Map of California as an island. Ink and watercolor with pictorial relief. Icebergs are breaking off glaciers at Cape York, Greenland. English : Icebergs are breaking off glaciers at Cape York, Greenland. English : Butterfly, Vindula arsinoe. HMS Belfast, diagram of the boiler. English : HMS Belfast, diagram of the boiler. Phoenicoparrus jamesi, a group of James's Flamingos at Laguna Hedionda in Bolivia. English : Phoenicoparrus jamesi, a group of James's Flamingos at Laguna Hedionda in Bolivia. Pioneers Organization member pin depicting Vladimir Lenin. English : Pioneers Organization member pin depicting Vladimir Lenin. 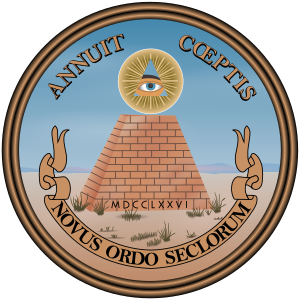 Reverse of the Great Seal of the United States. English : Reverse of the Great Seal of the United States. Portrait of Queen Wilhelmina of the Netherlands, 1901. English : Portrait of Queen Wilhelmina of the Netherlands, 1901. The coat of arms of the College of Arms from a 1595 manuscript called Lant's Roll. English : The coat of arms of the College of Arms from a 1595 manuscript called Lant's Roll. Category F5 tornado (upgraded from initial estimate of F4) viewed from the southeast as it approached Elie, Manitoba on Friday, June 22nd, 2007. English : Category F5 tornado (upgraded from initial estimate of F4) viewed from the southeast as it approached Elie, Manitoba on Friday, June 22nd, 2007. A Northwestern Crow (Corvus caurinus) near Whittier, Alaska. English : A Northwestern Crow (Corvus caurinus) near Whittier, Alaska. CAPE CANAVERAL, Fla. – Sandwiched by billowing clouds above and smoke and steam clouds below, Space Shuttle Atlantis hurtles past the lightning mast on top of the fixed service structure on Launch Pad 39A at NASA's Kennedy Space Center in Florida. English : CAPE CANAVERAL, Fla. – Sandwiched by billowing clouds above and smoke and steam clouds below, Space Shuttle Atlantis hurtles past the lightning mast on top of the fixed service structure on Launch Pad 39A at NASA's Kennedy Space Center in Florida. Windsor Castle Upper Ward Quadrangle panoramic view. Taken with a Canon 5D and 24-105mm f/4L IS lens. English : Windsor Castle Upper Ward Quadrangle panoramic view. Taken with a Canon 5D and 24-105mm f/4L IS lens. Swiss rescue helicopter in action: Rega's Eurocopter EC-145 (model BK 117-C2) with registration "HB-ZRE". English : Swiss rescue helicopter in action: Rega's Eurocopter EC-145 (model BK 117-C2) with registration "HB-ZRE". Portrait of Queen Marie Antoinette of France, 1775. English : Portrait of Queen Marie Antoinette of France, 1775. English : Picture of a Boat Orchiden (Cymbidium Clarisse Austin 'Best Pink') flower chain. A crevasse (moulin) in the Langjökull glacier, Iceland. At the time it was perhaps three or four meters long, a meter wide and some 30-40 meters deep. English : A crevasse (moulin) in the Langjökull glacier, Iceland. At the time it was perhaps three or four meters long, a meter wide and some 30-40 meters deep. Stained glass windows at Notre-Dame, Geneva, Switzerland. English : Stained glass windows at Notre-Dame, Geneva, Switzerland. Sabah State Mosque minaret in Kota Kinabalu, Malaysia (Borneo). English : Sabah State Mosque minaret in Kota Kinabalu, Malaysia (Borneo). Field of hay bales, Omeo Victoria, Australia. English : Field of hay bales, Omeo Victoria, Australia. Gustave Doré's illustration to Dante's Inferno. Plate IX: Canto III: Arrival of Charon. "And lo! towards us coming in a boat / An old man, hoary with the hair of eld, / Crying: 'Woe unto you, ye souls depraved!'" (Longfellow's translation) "And, lo! toward us in a bark / Comes an old man, hoary white with eld, / Crying "Woe to you, wicked spirits!" English : Gustave Doré's illustration to Dante's Inferno. Plate IX: Canto III: Arrival of Charon. "And lo! towards us coming in a boat / An old man, hoary with the hair of eld, / Crying: 'Woe unto you, ye souls depraved!'" (Longfellow's translation) "And, lo! toward us in a bark / Comes an old man, hoary white with eld, / Crying "Woe to you, wicked spirits!"